Birds singing from the treetops, peaceful Sundays in the blooming gardens, children playing and sunshine on the yellow façades. It could be a Danish village, but it’s not! 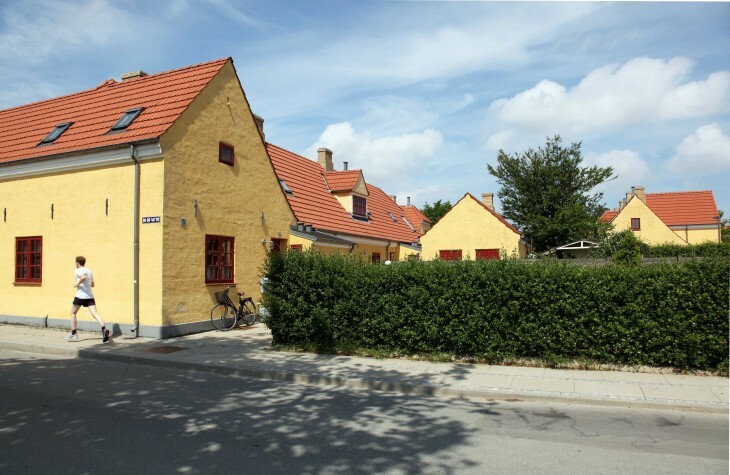 Named after the colour of the houses, the Yellow Town – known as Chinatown in less politically correct days – is located in the most unexpected place in Copenhagen. Between Vesterbro and Kalvebod Brygge is DSB’s huge central railway workshop. This no-man’s-land, about the size of 70 football pitches, is littered with railway tracks, wild flowers, scrapped wagons and large workshop buildings. And then – in a corner of it all – you come across the idyll that is the Yellow Town. The houses were built for railway staff in 1909, so they could be on the scene in just a few minutes in the event of a derailment or broken tracks. Alarms were installed in each of the homes to guarantee a rapid response. Once one of Copenhagen’s biggest workplaces, today there is an air of abandonment here on Otto Busses Vej, named after a former director of engineering who played a key role in the development of the steam locomotive. One of the entrances to the Yellow Town is via a low tunnel from the busy Enghavevej. Entering this graffiti-lined passageway is like disappearing down a rabbit hole in ‘Alice in Wonderland’ and popping up somewhere completely different. Squinting in the darkness, you make out a yellow light at the end of the tunnel. Don’t expect to find much in the way of activities in the Yellow Town – though there is a small playground and picnic tables – but do expect to feel that you have discovered a quite special spot in Copenhagen that time has forgotten. The lovely houses in the Yellow Town were built as official residences for employees of the railway’s emergency service, who had to live nearby so that they could provide a rapid response. They are the railway equivalent of the Navy’s housing at Nyboder. The houses were built in 1909, and it was 100 years before the requirement for employees to live on site was lifted, to allow people other than DSB employees to rent the houses. The waiting list quickly grew so long that DSB had to close it. Despite its slightly odd location in the middle of railway terrain, the Yellow Town is a popular place to live, and residents refer to it as ‘Paradise’. Near the Yellow Town is the Yellow Palace, officially called the Command Post Tower, from where freight rail traffic is controlled. The building played a key role in the famous Danish film Olsen Banden på Sporet (The Olsen Gang on Track). The area is accessible by wheelchair. No. Bring a packed lunch. Plenty of dining options just outside the railway area.